Myanmar has inspired some of the most renowned poetry and prose; it’s an intoxicating place that leaves a person somehow wanting more. As a romantic getaway, the country offers opportunities to delight and seduce at every corner, from historic Mandalay to hot air balloons over the plains of Bagan and Inle Lake in the high Shan hills. Arrive in Mandalay. After checking in at your hotel, visit the last royal palace of the Konbaung dynasty and recount the final days of King Thibaw and his beloved queen, Supayalat, before they were expelled to India by the British. Visit the sacred Mahamuni Pagoda and receive a blessing for auspicious travels. Squeeze in a quick turn around Kuthodaw Pagoda that houses the largest book in the world and then climb the 1729 steps up Mandalay Hill (or catch the lift up!) to be rewarded with a stunning sunset. The romance in Myanmar begins. Just to the south of Mandalay, take a stroll down the longest teak bridge in the world, the iconic U Bein bridge in Amarapura – and then take a canoe for two to view the bridge from the water. The town of Amarapura is full of textiles stores and small metal works factories, where you can watch master craftsmen cast Buddha statues in bronze or visit a weaving factory to see how fabrics are made. At Inwa, you can take a horse and cart and around the quiet meandering roads that once made up a powerful kingdom’s capital city. Stop by at the Bagaya Kyaung, a living monastery that is still the centre of many local activities, including lively games of football in the afternoons; it’s a real pleasure to watch everyone come out to support their teams, and even the novice monks forget their strict codes to cheer the players on. Take a car from Mandalay to the laid back town of Hsipaw, high in the Shan Hills. Start early for a half day trek through villages around Hsipaw and take lunch with a local ethnic Palaung family. Shan State is made up of diverse ethnicities that make the area one of the best culinary melting pots; the food is fresh and flavour rich, with noodle dishes like Tofu Nwe that include a unique chickpea tofu, and some dishes mimic the food of nearby Yunnan Province in China. Take afternoon wandering around the town and then experience the sun set across the Shan Hills from the viewpoint above Hsipaw. From Hsipaw, head to Naung Paing and slow the pace down with a romantic train ride. The rail journey from Naung Paing to Pyin U Lwin meanders slowly over the gorgeous Shan Plateau, taking you across the enormous Goteik Viaduct and offering great photo opportunities – just don’t drop the camera! Take a few hours exploring the old colonial hill station of Pyin U Lwin and its botanical gardens, and then head back to Mandalay for dinner by the palace walls. 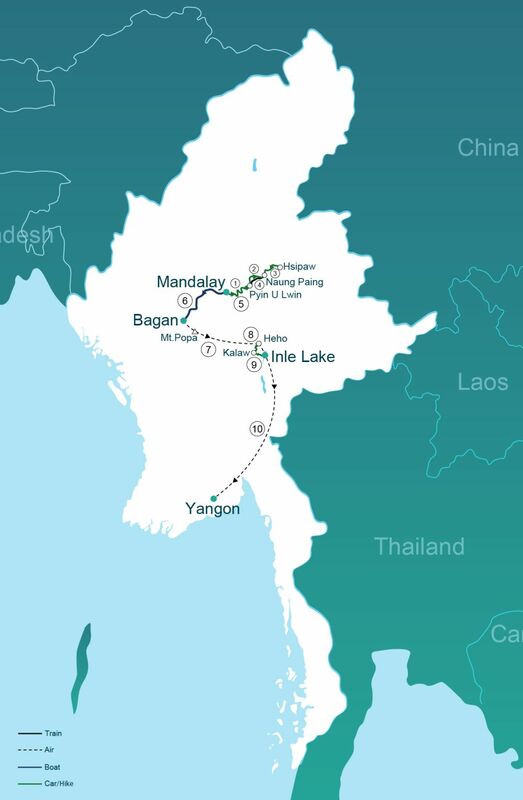 Lap up some leisure time on an overnight cruise from Mandalay to Bagan down the mighty Irrawaddy River; the journey is a quiet and relaxing experience, only broken by the occasional boat passing by. Arrive in the early hours of the morning, just in time to be whisked away for a thrilling experience on a hot air balloon ride, allowing you to watch the sun rise over the plains of Bagan, lighting up the thousands of pagodas below. An exhilarating experience made a little more decadent with a champagne breakfast. Transfer to your hotel, relax by the pool, or set off to explore the temples. In the afternoon, climb up the Gawdawpalin or Bupaya pagodas for perfect panorama views. The next day, start exploring at the Ananda pagoda, dating from the 12th century and famed for its gilded sikhara tower at the top of its structure. Gubyaukgyi pagoda has extensive murals of Buddha in his previous lives. Head south east of Bagan to explore the spectacular monastery at Mount Popa, which sits precariously on top of a volcanic plug. In the evening, enjoy some Myanmar wine over a candle lit dinner by the pagodas. Depart Bagan to Heho by plane, then to Kalaw by car. Feel refreshed by the cool mountain air after the heat of the lowlands, and explore this bustling old colonial outpost with its large population of Nepali guides whose families remained here after the Second World War. Wake up early for a traditional Myanmar breakfast before starting your trek to Inle Lake. Hike through the beautiful and unspoilt Shan hills and spend the night at a local monastery or homestay. Arrive at the serenely picturesque lake via the crumbling mass of pagodas at Indein and then take some time to explore the area before heading to your hotel. If you go for the superior hotel option, a boat will take you to your hotel on the lake (standard hotels are located in the characterful town of Nyaung Shwe, at the northern end of the lake). Famous for its floating villages, gardens, markets and unique way of life of the local Intha people, Inle Lake easily fills a day of exploration. The village of Nampan is an excellent example of a traditional village, built on wooded stilts above the water and hosting the oldest pagoda on the lake, the Alodaw Pauk Pagoda – a large gem-encrusted golden shrine and an excellent people watching spot. Villagers here make a number of handicrafts and cheroots. Finish up your day with sunset wine tasting at Red Mountain Estate vineyard and then a romantic dinner on the lakeshore. Depart Heho to Yangon. You’ll have time in the afternoon for sightseeing and an evening visit to the heart of Myanmar’s Buddhist life – the magnificent Shwedagon Pagoda. The following morning, try out some sweet laphayet (Myanmar tea) at one of the many downtown tea shops on your final day in the country. Pair it with some fresh ee char kway, a deep fried dough snack to be really naughty on the last day of your tour and then walk it off by wandering the streets of downtown and taking in the colonial architecture. There will also be some time for those last minute goodies at the Bogyoke Market before you head home. Would you like to extend your tour to the beautiful and relaxing Ngapali Beach , or hideaway in the remote tropical paradise of the Myeik Archipelago? Our travel advisors will be able to arrange this for you, along with any other travel, accommodation or activity requirements you may have. Just fill out the ‘Any further queries’ box after you have clicked on the ‘Book Tour’ button.